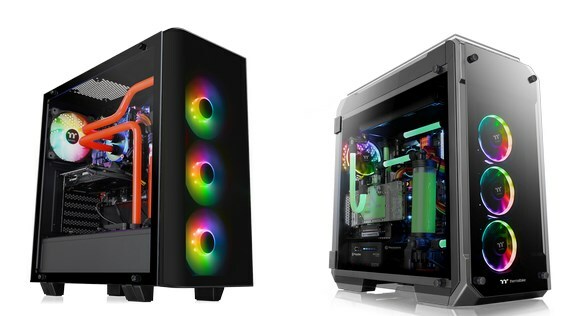 Two new cases from ThermalTake. We have the View 71 TG RGB Plus full-tower (pictured left), and the mid-tower View 21 TG RGB Plus. These models are sold via the TT webshop for 299.90EUR and 144.90EUR, respectively. TT RGB PLUS Ecosystem is the intelligent lighting system for PCs that combines the most advanced addressable LED lighting with Thermaltake’s patented TT RGB PLUS Software. TT RGB PLUS ecosystem provides nearly unlimited possibilities for playing with colors, synchronizing lights to games, music, CPU temperatures or other TT RGB PLUS products, including case fans, CPU/VGA water blocks, AIO CPU coolers, PSUs, LED strips, gaming keyboards, headsets, mice and mouse pad. The patented software allows users to change the light modes, colors, speeds, brightness, fan speeds, and even supports AI voice control in iOS and Android devices. Thermaltake Pure Plus 12 Fan TT Premium Edition 120mm high-static pressure fans with a 16.8 million colors LED ring and 9 addressable LEDs, the Pure Plus 12 RGB features compression blades and hydraulic bearings, controlled by the patented TT RGB PLUS Software and AI interactive voice control. The View 21 TG RGB Plus features flexible cable management with a maximum 50mm in width, supports a CPU cooler with a maximum height of 160mm and a dual expansion slot VGA of up to 410mm in length without HDD rack. It also has the ability to accommodate multiple 3.5”/2.5” storage devices at the same time, and most importantly, the hidden drive bay design guarantees expandability for more liquid cooling components. Fitted with a superb front filter, front panel filter, and the bottom filter, providingexcellent protection and reduction against dirt and dust. The View 21 TG RGB Plus comes with fully modular drive cages that provide the ease of installation/removal. Maximizing the interior space for custom cooling loops thanks to the design of a “2+2” HDD mounts inside the left side panel and the two 2.5”-compatible HDD slots in the PSU cover. Two 3.5” and two 2.5” HDD brackets are included, allowing users to freely mount 2.5” HDDs either on the wall of the PSU cover or vertically inside the left side panel to show off their HDDs. The View 71 TG RGB Plus Edition allows users to build a complete high-end system that supports motherboards up to standard E-ATX with high-wattage PSU up to 220mm length. With extended graphics card support (up to 410mm), the case simultaneously protects the hardware and increases the CPU’s overclocking potential for users looking to get the most out of their hardware. Specially designed for dual GPU placement options, the View 71 TG RGB Plus Edition has support for vertical graphics card layout with dual vertical PCI-E slots. The integrated riser GPU support bracket not only prevents the graphics card from sagging, but also helps to reduce the weight on the motherboard PCI-E slots. Thermaltake TT Premium PCI-E 3.0 Extender (Optional) – Supports a wide range of GPU solutions. This is an extreme high-speed cable with highly-routable design, EMI shielding with conducting polymer are crafted for meeting the most demanding system. Available in 300mm, 600mm and 1000mm length. Turn the tides on traditional radiator mounting and bring out the glorious view of custom loop or all-in-one radiator applications with vertical radiator viewing. Supporting proper placement for 120mm and 140mm radiator applications up to 420mm in length, gain more compatibility when pairing up both CPU and GPU cooling solutions. Take on even more with custom loop options for enthusiast grade cooling, fitment, and flow. Premium-quality 5mm thick tempered glass guarantees the durability of the window and adds overall strength to the chassis. Swing Doors on either side allow the user easy access to the internal components as well as the ability to remove the doors entirely for complete access to the internals. The View 71 TG RGB Plus Edition has plenty of space for advanced AIO/DIY liquid cooling components. The case natively supports all types of AIO liquid cooling solutions. The case houses up to triple 420mm liquid cooling radiators and up to 360mm AIO liquid coolers. Most importantly, the case design is optimized for providing users a quick way to access the drain valve without having to tilt the entire PC when draining coolant from the loop.